The market seems to have taken a bit of a tumble over the last week, to put it mildly. Many of the big sites are quiet. And at least one mortgage broker has seen his business drop from fourteen enquiries a day to one. Since rising property values are where half of the money for used cars comes from we are bound to see a levelling off. The trick will be buying just before it bottoms out and bounces back, which is what has always happened before. Now could well be the time to buy. 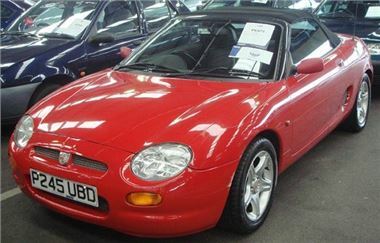 Could I tempt you with this 53k mile 97P MGF VVC, sold for just £1,300? Maybe a rather leggy but clean 119k mile 98S BMW Z3 1.9, sold for £4,200? Or possibly the cheapest 88k mile 97P Mercedes SLK230K auto I’ve ever seen at £6,200? Fleet owners holding Porsche 911s were trying to buck this trend, some more successfully than others. Top Porsche price of the day was a resounding £62,100 for a year old 7k mile 997 Carrera S convertible. Bottom was £15k provisional for a 105k 98R 996 3.4 with 105k miles. A really beautiful 87k 99T Rover 75 2.5 KV6 Connoisseur, spotless inside and our, sold for £1,750. A 71k mile 99V Rover 414 SEI went for a monkey. While a 44k miles unwarranted 96P Rover 114GSI went for £175. But don’t expect anything that qualifies for £35 a year VED to be cheap. Seems that punters are prepared to pay up to £1,000 over the odds to avoid £80 more a year in tax. I guess the same people who used to spend four hours queuing at the pumps on Budget day just to save threepence a gallon. Here’s the list. As usual, ‘s’ means sold. ‘p’ means top provisional bid, ‘n/s’ means not sold. ‘n/w’ means miles not warranted. ‘MNW’ means unknown mileage. Volvo UK, Leaseplan Live Online, Black Horse, Lex, Bank of Scotland, Prime Fleet, Jardine p/x, Inchcape p/x, Sytner p/x, Snows Group p/x, Trident Honda p/x. Light Commercials from Lloyds TSB, Dagenham Motors, Royal Mail, Lex, Vauxhall leasing, Fleet Direct, Peugeot, Northgate, Non Runners. Fleet & Finance, LTSB Autolease, Lex, Bank of Scotland, Motability, Citroen UK, Masterlease, Hitachi Capital, Peugeot UK, General Section, Inchcape p/x, Charters p/x, Private Sure Sell. Fleet Direct, Lex, Bank of Scotland, Inchcape Prestige, Porsche Retail p/x, Mercedes Benz Retail p/x, TOP CAR, Franchised Dealer p/x, Inchcape no reserve, Hartwells p/x, Pendragon p/x. Leaseplan Live Online, Black Horse, Lex, Bank of Scotland, Jardine p/x, Inchcape p/x, Sytner p/x, Snows Group p/x, Trident Honda p/x.